A rare post from me these days but one that I have been looking forward to writing. 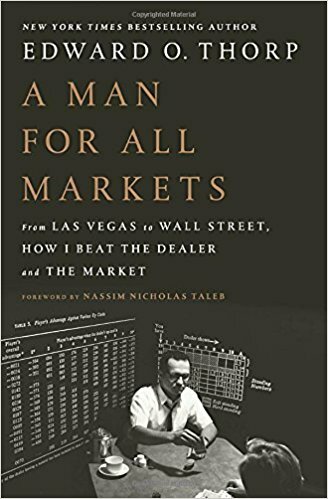 A Man for All Markets is written by Edward O Thorp, a name that most smart traders will know. Written by the man himself, the book covers the entire life of this successful academic, "gambler" and financier. Obviously, I put the word gambler in quotes because Ed Thorp is anything but a gambler. Using John Kelly's work on optimal wealth growth, Thorp created profitable strategies for both roulette, blackjack and baccarat before moving into the financial markets, where he discovered the Black-Scholes pricing formula before Black and Scholes themselves had proven Thorp's findings. The first few chapters of the book cover the early life of Thorp, a childhood that would be the envy of any inquisitive child. In a world that now smothers children in cotton wool, there is much to be said for allowing a child to run riot so long as they learn but do not harm others. And run riot Thorp did, becoming an autodidactic chemistry and physics student at an under-performing school that never expected much from him. To say that Thorp was a precocious and confident child is an understatement. Thorp's talent in the sciences earned him a scholarship to university by way of scholastic science competitions. Naturally, Thorp taught himself the required knowledge with a little help from his teachers. Without the scholarship we might never have heard of Edward O Thorp. During his early academic life Thorp developed card counting and an optimal staking strategy using Kelly Criterion. Foremost in Thorp's mind was wanting to be the first to publish his work in an academic journal rather than to profit. To that end Thorp met up with Claude Shannon (father of information theory) to help get his paper published. Thorp then turned his attention towards the finance, the world's biggest casino with unlimited bet sizes. Discovering how to accurately price options before Black and Scholes, Thorp learned how to hedge a stock against its derivate for profit. Thorp set up one of the first quantitative hedge funds and made millions for his clients. This book is certainly not a "get rich quick" book. Nor is the book an advertising pamphlet posing as a book, only to point at a website with no-money-back get rich quick gambling strategies. Simply, the book is about a boy's desire to understand the world he lived in. Thorp self-taught himself the sciences and progressed to be a professor of mathematics and conqueror of the markets. Throughout the book you will see that Thorp is always concerned with edge, reducing risk and never betting until he knows the odds are firmly in his favour. How many do we see announcing they are going to have a go at sports trading to teach themselves how to trade in the financial markets and all with no knowledge of edge or risk? Joseph Heller and Kurt Vonnegut were at a party given by a billionaire when Vonnegut asked Heller how it felt to know that their host might have made more money in one day than Heller's Catch-22 since it was written. Heller said he had something the rich man could never have. When a puzzled Vonnegut asked what that could be, Heller answered, "The knowledge that I've got enough." And that's what life in general (including trading) is all about. Those who just can't stop and will risk everything for a little more will never be fulfilled. Those getting into trading because they want more but don't know how will only become more unfilled and maybe worse. Thorp's book resonated slightly with my life; self-taught because I could never sit and listen to a dreary teacher. I got into university through the backdoor as a "mature student". Interested in sports betting markets, my research was picked up by a company creating financial trading software and where I worked for five years. No millions in the bank but I am more than content. Enough was just enough.